Ron Rash, Lee Smith, and Wiley Cash at the Appalachian Studies Conference at UNC Asheville. More than 1,000 scholars gathered on UNC Asheville’s campus on March 14-17, 2019, for four days of workshops, film screenings, readings, musical and dance performances, and more during the 42nd annual Appalachian Studies Conference. The conference focused in on the theme of “AppalachA’ville,” and explored what it means to be vibrant 21st century city in the traditionally rural region of Appalachia. Along with panels, discussions and workshops you’d expect to find at an academic conference, unique highlights of “AppalachA’ville” included a screening of the award-winning documentary hillbilly; an Innovation Expo featuring a selection of area organizations and businesses that illustrate how people come together to identify needs, solve problems, build community, and strengthen the local economy; an Affrilachia y el Caribe poetry reading; a storytelling performance by actress Barbara Bates Smith and accompanist Jeff Seben; and an old-time square dance. Even the awards banquet featured an old-time string band performance, traditional ballad singers, and fleet-footed cloggers. Erica Abrams Locklear and her daughter accept the Stephen L. Fisher Award for Excellence in Teaching. Among those celebrated at the awards banquet was UNC Asheville professor of English Erica Abrams Locklear, who received the Stephen L. Fisher Award for Excellence in Teaching. 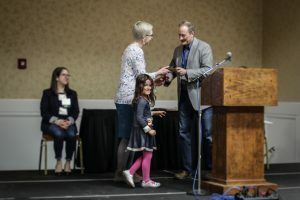 “I want to thank the Appalachian Studies Association, an organization that has been so crucial to my career, and I also want to thank UNC Asheville, a university that semester after semester provides me with the opportunity to teach about the region and people I love most,” said Abrams Locklear, who was accompanied to the podium by her young daughter, Faith. The conference keynote on Saturday, March 16, sponsored by the North Carolina Humanities Council, featured three celebrated Appalachian authors in conversation: UNC Asheville Writer-in-Residence and New York Times bestselling novelist Wiley Cash moderated a discussion with Lee Smith—well-known story teller and author of 18 books — and Ron Rash, the Parris Distinguished Professor in Appalachian Cultural Studies at Western Carolina University and author of 22 books. The three authors discussed their journeys to becoming writers, teaching, the importance of seeing Appalachia represented in literature, and much more. It was a campus reading by Eudora Welty, a Pulitzer Prize-winning Southern author, that changed her ideas about what it meant to be a writer, and showed her that literature could be written about places like the one where she grew up. The Bailey Mountain Cloggers of Mars Hill University perform at the awards banquet. Cash invited local novelist David Joy to speak to the class, allowing his student to see a successful writer sharing stories not unlike his own. “You could see the student sitting up straighter, and hearing his own story in David’s story, and knowing, ‘David’s got books, so maybe what I’m doing is worth something too,’ and that’s amazing how it can speak to a student,” Cash said.